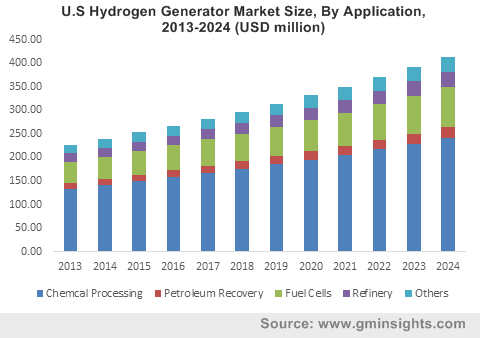 Hydrogen Generator Market size was valued at over USD 800 million in 2015 with industry expectation of more than 5% growth up to 2024. Stringent emission regulations for clean fuel adoption such as hydrogen over fossil fuels is prospective to boost demand. Increasing hydrogen gas applications across as oil & gas, refinery, and chemical are anticipated to positively influence industry growth. Global hydrogen consumption in refineries is over 12 billion standard cubic feet a day. This is forecast to drive hydrogen generator market growth during the forecast period. Abundant obtainability of low cost natural gas feedstock accompanied with high purity hydrogen is forecast to be key factor propelling industry growth. Also, increasing hydrogen use across food & beverage to remove harmful viruses and bacteria may further compliment global hydrogen generator market growth. Increasing fuel cell demand for the automotive, residential and commercial industry, owing to its ecofriendly characteristics is anticipated to stimulate industry growth. Global electric vehicle sales were market over 2 million units in 2015 and is projected to reach 7 million units by 2024. Increasing sales of electric vehicles unit will increase demand for hydrogen fuel stations, which is further anticipated to propel hydrogen generator market growth from 2016 to 2024. The industry has witnessed government initiative to minimize electric vehicle price. For instance, the U.S. Government announced awards worth over USD 7 million for R&D towards reducing current electric vehicle charger’s costs by 50% in the next three years. The government focuses on reducing oil dependence through advanced vehicle technologies such as fuel cells electric vehicles (FCEV). In addition, low fuel and maintenance costs results in operational cost savings coupled with government incentives scheme are key factors increasing cost competitiveness of electric vehicles in comparison to conventional vehicles. The Electric Vehicles Initiative (EVI), which is a multi-government policy forum dedicated to accelerate introduction and adoption of electric vehicles globally. EVI includes 15 member governments from Africa, Asia, Europe, and North America accompanied with participation from the International Energy Agency (IEA). Major automobile manufacturers including Ford Motors, GM, Nissan, Toyota, Honda, Mercedes-Benz and Tesla are major participants in the global electric vehicle market. Transportation risk and cost attached with hydrogen coupled with lacking storage infrastructure may hinder industry growth. However, increase need to minimize fossil fuels dependence for energy is forecast to drive industry growth. Onsite hydrogen generator market size is forecast to expand at over 5% CAGR. Increasing hydrogen gas demand in oil, gas, refineries and other industries owing to its low emission characteristics is anticipated to boost demand. Portable hydrogen generator market is projected to witness highest gains up to 2024 owing to drifting focus towards renewable energy. Environment sustainability, high power to weight ratio, and noise free characteristics are some of the features may positively influence product demand. Steam reformer electrolysis market was valued above USD 630 million 2015. The process produces hydrogen gas from hydrocarbon fuels such as natural gas which comprises methane (CH4), and methanol (CH3OH). Growing demand for hydrogen in production of chemicals and processing is forecast to boost hydrogen generator growth steam reformer electrolysis. Electrolysis process is forecast to expand at over 5% CAGR. In this process, hydrogen gas is produced by splitting the water molecule. Increasing energy demand for clean and renewable sources such as water is likely to boost demand. Chemical processing application was valued at over USD 480 million in 2015. Increasing demand for hydrogen across different chemical processes is likely to propel hydrogen generator growth from 2016 to 2024. Fuel Cells application is set to witness gains above 6% CAGR. Increasing demand in residential and transport owing to low emission along with minimum operational cost may drive industry growth. Refinery application is projected to reach USD 120 million by 2024. Rising hydrogen use to process crude oil to refined fuel such as diesel, gasoline, and remove contaminants such as sulphur form these fuels is likely to boost hydrogen generator market growth for refinery application. North America, led by the U.S. and Canada hydrogen generator market size, was valued at over USD 300 million in 2015. Increasing awareness towards clean fuel for transportation along with high demand in refueling stations (for FCEV) and power generation plants is forecast to boost industry growth. Also, shale gas exploration in the region will further compliment industry growth for refinery application. Asia Pacific, led by Japan and South Korea, is forecast to expand at over 6% CAGR. Growing hydrogen generator application in refineries owing to increasing demand for petroleum products coupled with strict norms in the region is likely to drive growth. Global hydrogen generator market share is consolidated. Major industry participants include Linde AG, Hydrogenics Corporation, and Air Products & Chemicals Inc. Other notable participants include Idroenergy, Air Liquide SA, Praxair Inc., Airgas Inc., ParkarBalston, and McPhy Energy. Hydrogen generators are devices which produces hydrogen via process such as steam reformer electrolysis and electrolysis. Increasing demand for clean fuel along with rising need to reduce non-renewable and depleting fossil fuel dependency is forecast to be key factor propelling industry.